How long has Redamak’s been around? What is the secret to your burgers? Why are we now serving Lettuce and tomato on our Burgers? What is the famous working person’s special? How many pounds of meat / patties do you use per year? Will Redamak’s ever open in the winter? How many employees work at Redamak’s? How many customers do you seat? I can’t find my kids? Why are we introducing Customer Coaster pagers? Do you recommend any area websites? The current owners are Charles B. Maroney and James L. Maroney, who along with their parents have owned Redamak’s since 1975. Both are still active in the business. For more information on the history of Redamak’s, click here. Original owners, George and Gladys Redamak, started the business in 1946. The Maroney family bought the business on July 15, 1975. For more information on the history of Redamak’s, click here. Our hamburger meat is cut, ground, and pattied in our meat cutting room three to five days a week, depending on the time of the season. Honestly, there is no real tangible secret ingredient. Quality of products, affordable menu, atmosphere, service, dedicated employees, and years of tradition all play their part in our secret ingredient. Over the years we have spent countless hours discussing adding Lettuce & Tomato to our menu. In 2016, we partnered with Green Spirit Farms to provide fresh local Muir Lettuce for our Burgers & Sandwiches and Spirit Mix for our Salads. By adding lettuce and tomato we can offer our customers countless menu options and we feel we are truly enhancing the Fresh Ground Chuck known as a Redamak’s Legendary Burger! 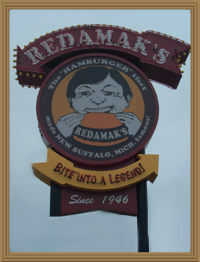 For years, Redamak’s was known as a “tavern” that served some food. George and Gladys felt that coffee would not compliment the alcohol service, as that was the primary focus of the business at that time. In addition, the original building was very congested and had many youngsters running around; safety with hot beverages was therefore a concern. But we do offer many other drinks – click here to access our menu. Years ago, New Buffalo had an active train yard, with many local residents working for the railroad. A group of workers approached Redamak’s asking for lunch specials. The Maroney’s got together and created “The Working Person’s Special” specifically for those railroad men and women. This was in anticipation that they would eat with us throughout the week…and they did. Well, the rest is history. * Statistics based on individual patties; approximately three to a pound. Every year, no matter what day of the week March 1 falls on, we open for the season! We are open 8 months a year March 1st to October 27th. Click here for location, hours and directions. Yes. This gives the staff an opportunity to share valuable time with their families, while the building and its mechanicals can be cleaned up, maintained, and repaired or replaced. Get caught up on much needed rest, visit with family and friends, and enjoy quiet time, which doesn’t last long. Before you know it, February 1 is just around the corner, and facility cleanup and preparation starts all over again. At this time, it is unlikely, mainly because we hold only a 10-month resort liquor license. Technically, we could extend the season through the months of November and December, but would have to close in January and February by law. For of the 2017 Season, our employment peaked at 175 employees just before July 4. Interested in joining the Redamak’s Team? Click here. Indoor seating accommodates 190 patrons. Our “four-seasons” porch accommodates up to 180 patrons. Have you checked our game rooms? We have a game room in the front of the facility. Chances are good that your kids are there – playing one of our many video games! Click here to learn more about Kid Friendly Fun at Redamaks. On average, 15 to 20 minutes, but that truly depends upon the size of the party, the day, time of the week, and time of year if the porch is open. Generally there is no wait at all. Moving from the antiquated plastic number and loud speaker paging system we are confident the new coaster system will lessen the “Noise Pollution” along with assisting customers to be sat in a more efficient manner here at Redamak’s! Yes we do. Private parties can be easily booked, depending upon the time of year, day of the week, time of day, and number in the party. For more information, click here. 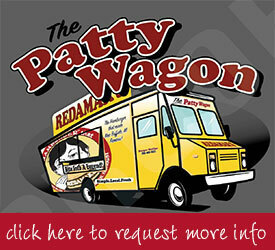 We do not accept credit or debit cards – Redamak’s is a cash-only establishment. We offer a Horizon Bank ATM machine in our lobby. We also accept personal checks, as long as the customer has a valid driver’s license and current phone number. There is so much in Harbor County to enjoy, but here are a few sites to help make your visit even better!